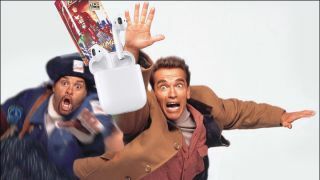 If you’re hoping to see a set of Apple’s AirPods under the tree this year, you may find yourself reenacting the Arnold Schwarzenegger classic Jingle All The Way. The Bluetooth earphones are selling out online and in stores. If you want to buy straight from the source, Apple is now shipping any new orders of AirPods in January. The official Apple site – on the US side – claims that orders will be fulfilled in seven working days which (at the time of writing) is after Christmas but still in 2017. When you actually click through to select a delivery date and enter your Zip Code, however, you’re given a delivery date in January. On the UK side, you don’t even get that far, with the site claiming the first delivery will be January 2. What’s more, third-party retailers are also selling out, with online retailers estimating January shipping and physical stores appearing short on stock too. Long story short, it’s worth heading to your local Apple store as soon as you can to see if they still have any.